Urgent care centers are a rapidly growing segment of the healthcare industry. Since the first of these centers opened in the 1970s, there are now more than 10,000 across the country. These facilities provide walk-in treatment for sudden or unexpected illnesses and injuries that are beyond the scope of a typical primary care practice, but don’t require a costly trip to the ER, according to Urgent Care Now in New Jersey. Urgent care fills a gap in the health care system created by two fundamental issues: increasing wait times to see primary care physicians and the cost and wait times for emergency room visits. “Our Manahawkin site is the first urgent care in New Jersey to be accredited by both the Joint Commission and the Urgent Care Association of America (UCAOA), which we feel set the gold standard for quality and patient safety within the urgent care industry,” says James K. Jones, Director of Business Development for Urgent Care Now. 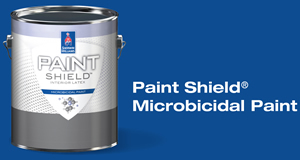 So when the time came for an interior repaint at the Manahawkin, N.J. center, it made sense to use new Paint Shield® Microbicidal Paint from Sherwin-Williams. They first became aware of this revolutionary new coating when they were given a presentation by their local Sherwin-Williams rep. Application of the product was a breeze for Dennis Motta, the Urgent Care Now Facilities Director who painted the rooms at the Manahawkin facility. After cutting in, he rolled on two coats.